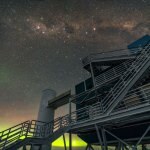 A new telescope, part of an international effort to develop and build the world’s largest, most sensitive gamma-ray detector, was unveiled to the public Thursday. UW–Madison scientists developed a camera at the heart of the telescope. An international team of researchers at the IceCube Neutrino Observatory has made a critical measurement that may one day help predict new physics beyond the Standard Model, which seeks to explain the fundamental forces of the universe. 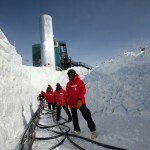 With the latest results from the icy observatory at the South Pole, scientists are almost certain that there is no such particle. 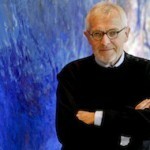 Francis Halzen, the University of Wisconsin–Madison physicist and leader of the giant neutrino telescope known as IceCube, has been named winner of a 2015 Balzan Prize. A new commercial for UW–Madison will premier during the season-opening Badger football game on Aug. 5. Learn more about the cutting-edge research highlighted in the spot. High on a sleeping Mexican volcano, a new particle astrophysics observatory is about to blink to life, commencing an all-sky search for very high-energy gamma rays - a search that could greatly expand the catalog of known gamma ray sources and chip away at the mystery of the cosmic rays that constantly bombard our planet. Thanks to a confluence of data from a suite of vastly different telescopes, there are tantalizing clues that the massive black hole at the core of the Milky Way may be a cosmic accelerator. 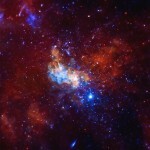 In a recent paper published in the journal Physical Review D, a team led by University of Wisconsin–Madison physicist Yang Bai reports a correlation of IceCube data with a recorded burst of X-rays from Sagittarius A, an object at the center of our galaxy that is believed to be a supermassive black hole. 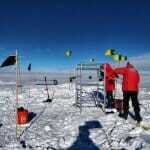 Hollow coring drills designed and managed by UW–Madison’s Ice Drilling Design and Operations (IDDO) program are used to extract ice cores that can analyze the past atmosphere. 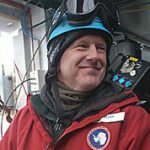 Shaun Marcott, an assistant professor of geoscience at UW–Madison, was the first author of a paper published today in the journal Nature documenting carbon dioxide in the atmosphere between 23,000 and 9,000 years ago, based on data from an 11,000-foot hole in Antarctica. 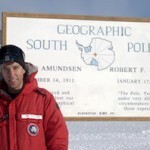 Francis Halzen, the University of Wisconsin–Madison physicist who was the driving force behind the giant neutrino telescope known as IceCube at the South Pole, has been named a winner of the 2014 American Ingenuity Award. Nathan Whitehorn, a postdoctoral researcher on the IceCube project at the University of Wisconsin–Madison, has been named a “Young Star” by the Division of Astrophysics of the American Physical Society (APS). 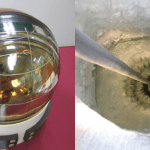 Less than one month after reporting the first evidence for cosmic neutrinos, the IceCube project received the 2013 Breakthrough of the Year award from the British magazine Physics World. 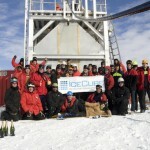 The IceCube Neutrino Observatory is one of a kind. 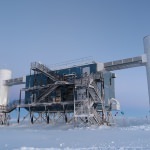 Built deep within the Antarctic ice, it is the world’s largest neutrino detector. Now, thanks to a collaboration between the Wisconsin IceCube Particle Astrophysics Center (WIPAC) and the Milwaukee Public Museum, it boasts another unique aspect: its own planetarium show. 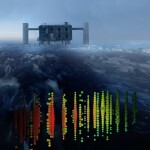 Building a neutrino telescope - a unique instrument that detects extremely small, high energy particles - out of 5,000 optical sensors embedded in a cubic kilometer of Antarctic ice, a tremendous engineering feat, was just the first challenge. 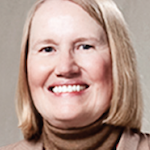 Rhonda Norsetter arrived on the UW–Madison campus as a student in 1964. Nearly 50 years later, she leaves as one of the most respected federal relations officers in American higher education. A massive telescope in the Antarctic ice reports the detection of 28 extremely high-energy neutrinos that might have their origin in cosmic sources. Two of these reached energies greater than 1 petaelectronvolt (PeV), an energy level thousands of times higher than the highest energy neutrino yet produced in a manmade accelerator.